With this presentation of Ohio Wesleyan University’s Distinguished Achievement Citation, the Ohio Wesleyan Alumni Association Board of Directors is honored to recognize Gregory L. Moore for his dedication to journalism and to future generations of budding reporters and liberal arts students. Greg graduated from Ohio Wesleyan in 1976 with a double major in Journalism and Political Science. During his 14-year tenure as Editor of The Denver Post, he led the newspaper to four consecutive Pulitzer Prizes. Before joining the Post, Greg honed his journalism skills at The Boston Globe, The (Cleveland) Plain Dealer, and The (Dayton) Journal Herald. 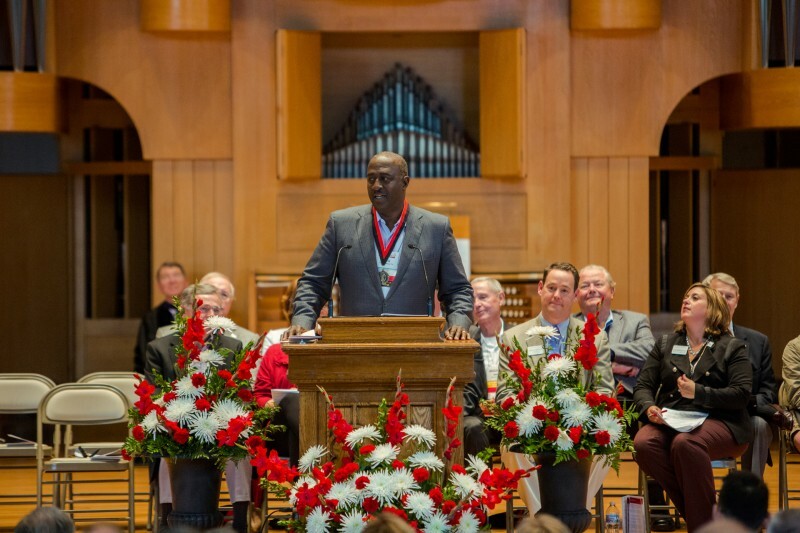 In 2015, Greg became the 10th OWU graduate to be inducted into the Ohio Foundation of Independent Colleges Hall of Excellence. In 2012, he earned the national Benjamin C. Bradlee Editor of the Year Award as well as the Alumni of the Year Award from Ohio Wesleyan’s Office of Multicultural Student Affairs. Greg was one of the Founding Members of the Cleveland chapter of the National Association of Black Journalists, and he has served his profession as a Board Member of the American Society of Newspaper Editors. He also has been elected as Co-Chair of the Pulitzer Prize Board. Greg has remained active at Ohio Wesleyan, generously giving of his time to mentor students, serve on the Board of Trustees, and volunteer with both the departments of Admission and University Advancement. Through his generous financial contributions, Greg has supported OWU’s Butler A. Jones House of Black Culture, the Willa B. Player Black Resource Center in Stuyvesant Hall, and a mission trip to Ghana. It is with great appreciation and admiration that we award Gregory L. Moore the Distinguished Achievement Citation for his work as a journalist, mentor, and philanthropist.